While on our first Holy Land tour of Israel back in 2010, our Jewish tour guide Shimone told us that every pomegranate grown on the face of the earth had exactly 613 seeds. He explained that if you opened up any pomegranate grown in any part of the world and de-seeded it, you would find exactly 613 seeds. I didn’t believe him then, but I had no way of proving it. Now why Shimone believed every pomegranate in the world had 613 seeds is important. But you are going to have to wait for it. There is a point, I promise. So since that trip, I have been on the search for pomegranates. The only problem is that you can only buy them in KY for about 1 month – from late October through early November. And if your local grocery store doesn’t have them (which most don’t in Campbellsville), you are out of luck. But then yesterday, we were in the Whole Foods Market in Louisville and Jennifer spotted a whole stack of pomegranates. So I bought one (for $2.50 mind you) to test the hypothesis. I carefully opened the fruit and removed each and every seed. 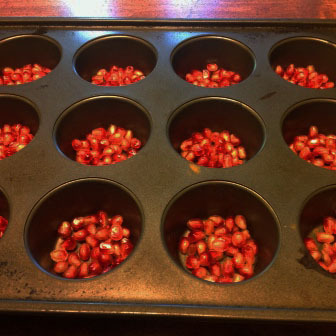 Then I organized the seeds into a muffin pan so I could count them accurately. The result? The total number did not even come close to 613; instead only a meager 374. Shimone’s little fib had been proven false. So what is the point to all this seed-counting business anyway? According to a Jewish legend (that obviously Shimone believed), the pomegranate is a living reminder of the Laws of God. Beyond the 10 Commandments we all know from Exodus 20, there are a grand total of 613 laws in what we call the Levitical Laws given by God to Moses on Mount Sinai. These 613 laws govern all of life for the Jewish people. It is these 613 laws that Jesus came to fulfill (Luke 24:44). The 613 points us to our absolute inability to be good enough to earn God’s favor (Romans 5:20-21). There is no one righteous, no not even one (Romans 3:10). Therefore we need the righteousness that can only come through Jesus Christ. His perfect life given as a sacrifice for our horribly imperfect one. While the pomegranate may not have 613 seeds, I can assure you it is just as difficult to perfectly obey 374 laws. Each seed reminds us that we have sinned and continue to fall short of the glory of God (Romans 3:23). I give God praise because He knew I would fall short and so made a way for me to be stand right before him. Romans 6:14 For sin will have no dominion over you, since you are not under law but under grace. I will never look at a pomegranate the same again. Not only can we not follow 613 or 374 laws, but Adam and Eve proved we can’t even follow ONE! The grace of God is so awesome…..reaching down to us when we are nothing but failures, redeeming us to be heirs with Christ. It is really amazing! Great post Professor…and keep being skeptical, it is one of the things I love most about you! God’s use of the pomegranate to remind us of his infinite love for us, even in the face of our constant failings, is as sweet as the seeds which come from this fruit, His beautiful creation.